Tiled floors and an open floor plan blend the living, kitchen and dining areas. 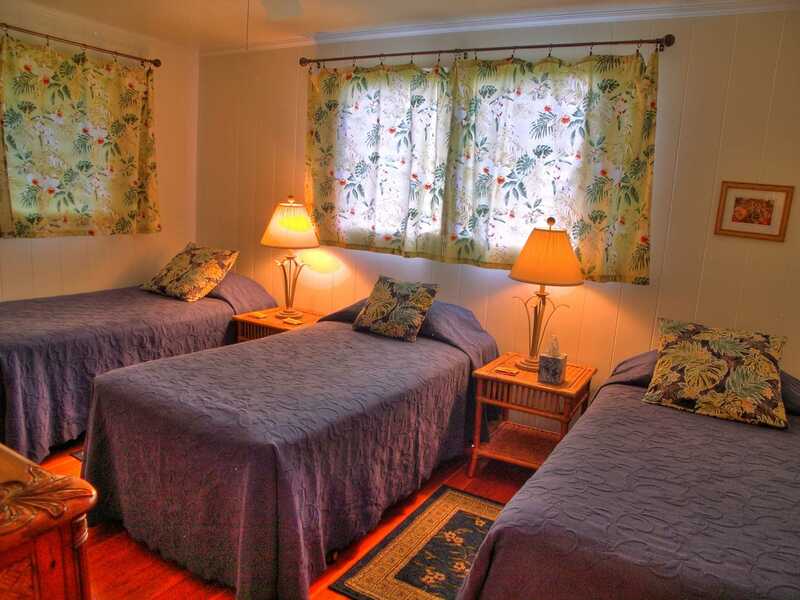 The Blue Room with hardwood floor features three twin beds (two can be converted into a king). 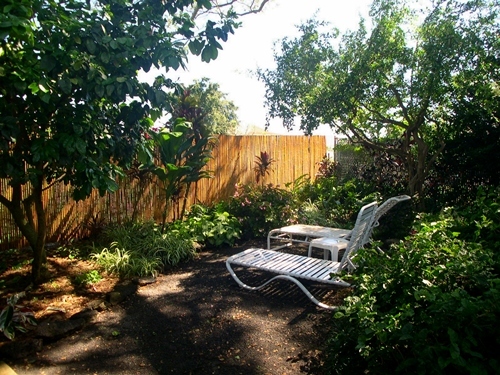 In the large secluded back yard is a private spot for sunning, reading and napping under the grapefruit tree. 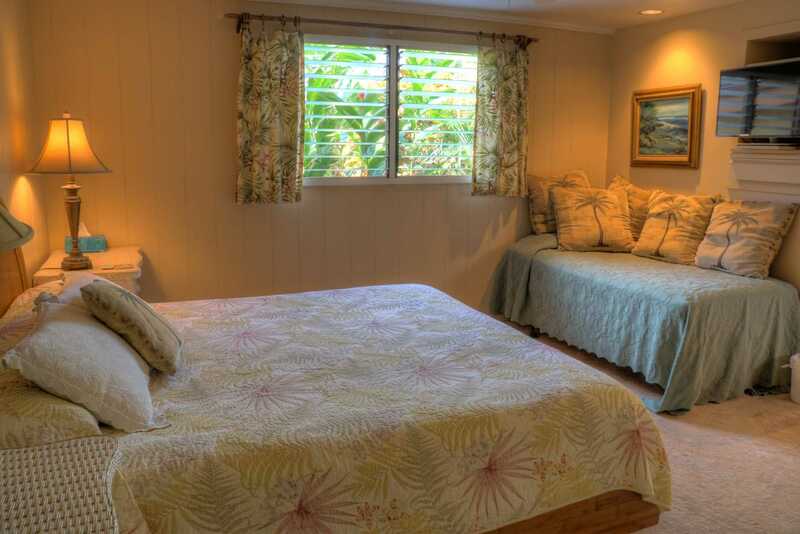 The upper master suite is a delightful, airy room above the surrounding foliage, you even have an "ocean glimpse". 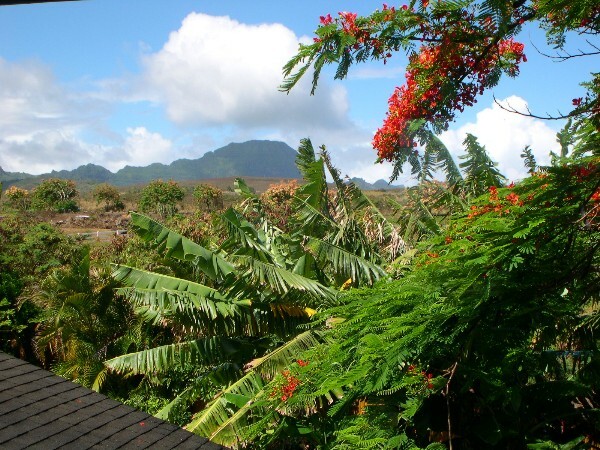 The view from the upper bedroom overlooks the landscaped grounds and the Ha'upu mountain range. 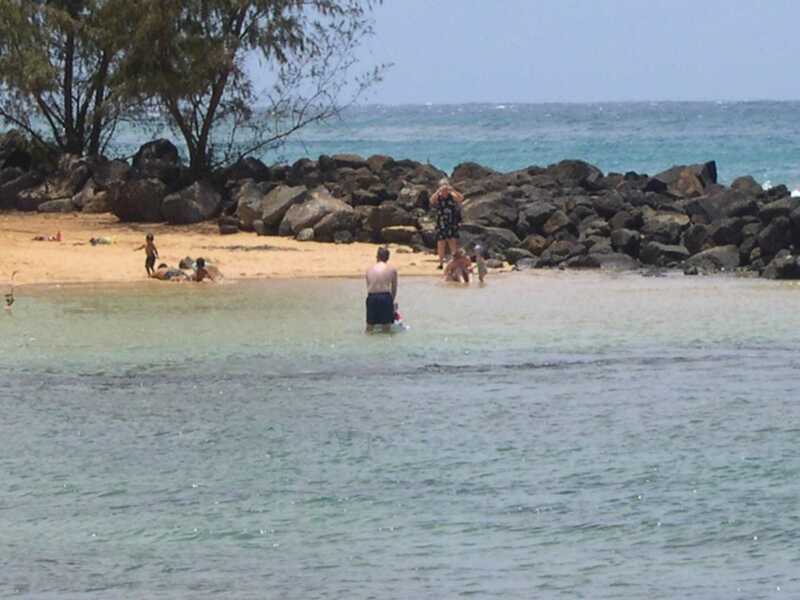 * 15 minute walk to Poipu beach, fun for adults and kids too. * Base rate is for 8 people, maximum 10. 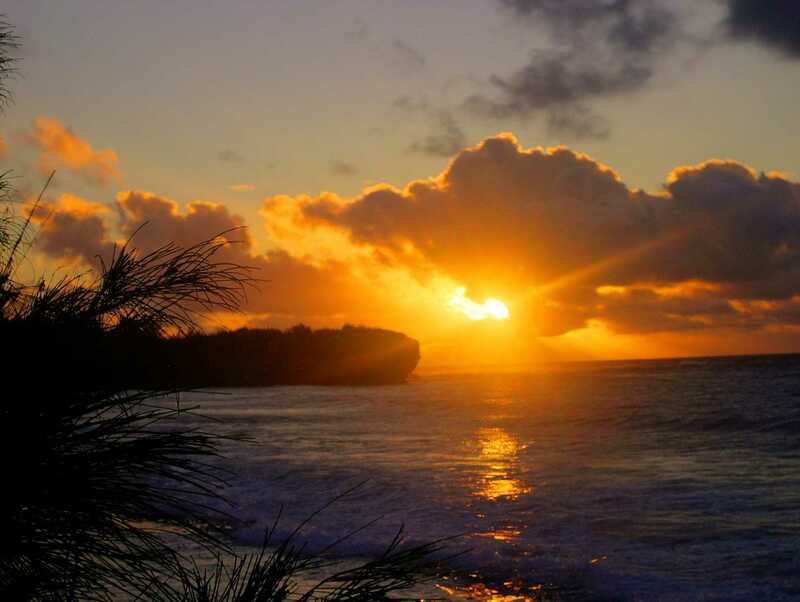 Please view "RATE NOTES"
Ala Muku, Hawaiian for "rainbow fragment" is a slice of paradise which offers you and your family and friends a relaxed, comfortable home base to enjoy and explore the beauty, activities, and natural wonders of Kauai. 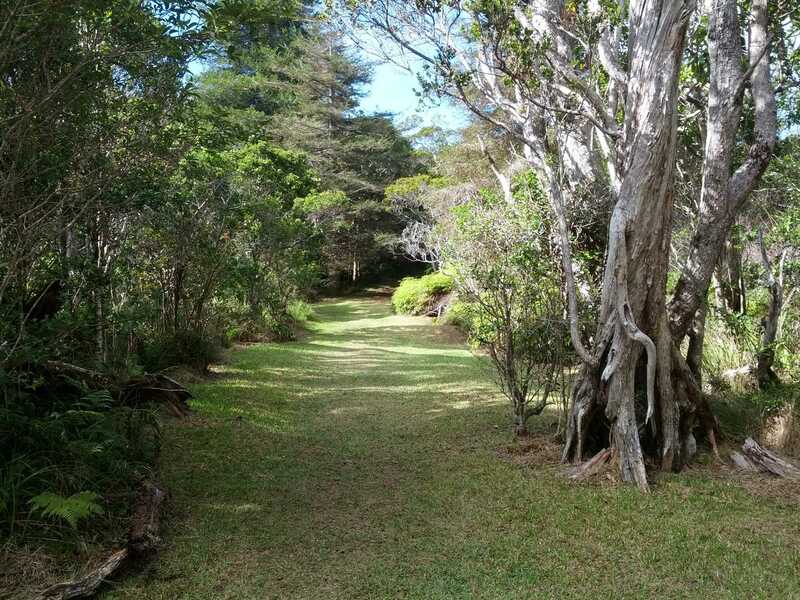 Located at the end of a cul-de-sac in a quiet residential neighborhood, this home is about a half mile to Poipu Beach Park and Brennecke Beach. Surrounded by lush tropical foliage, Ala Muku is a beautifully appointed 2,500 sq. 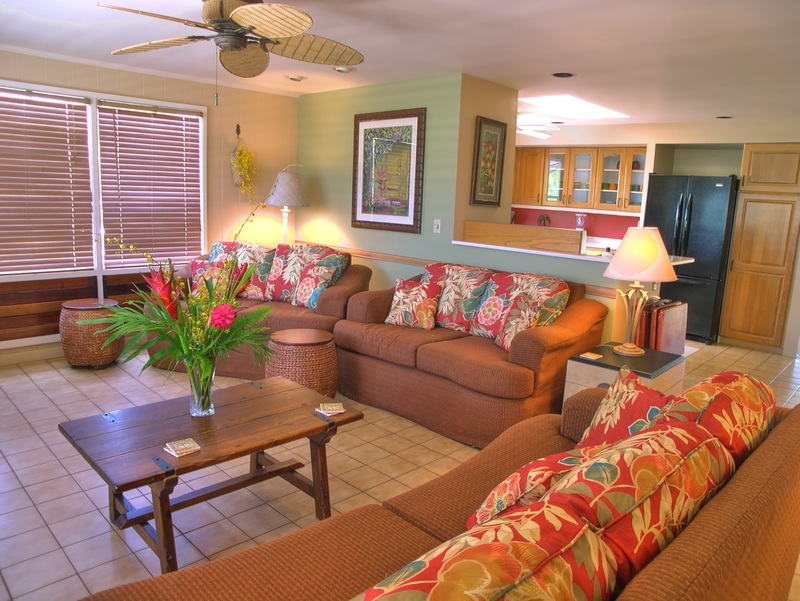 ft. home with festive island decor to enhance your stay in paradise. Relax and socialize in the many indoor and outdoor spaces. On the western front porch the palm fronds rustle in the gentle breeze of the Pacific trade winds. The plush sofas in the living room invite a nap or an opportunity to be entertained with music or a movie. All your culinary needs can be met in the cook's kitchen with its abundant counter space, up-to-date appliances and utensils. The dining room with atrium-like ambiance seats 10 people with additional dining for 4 in the kitchen nook. 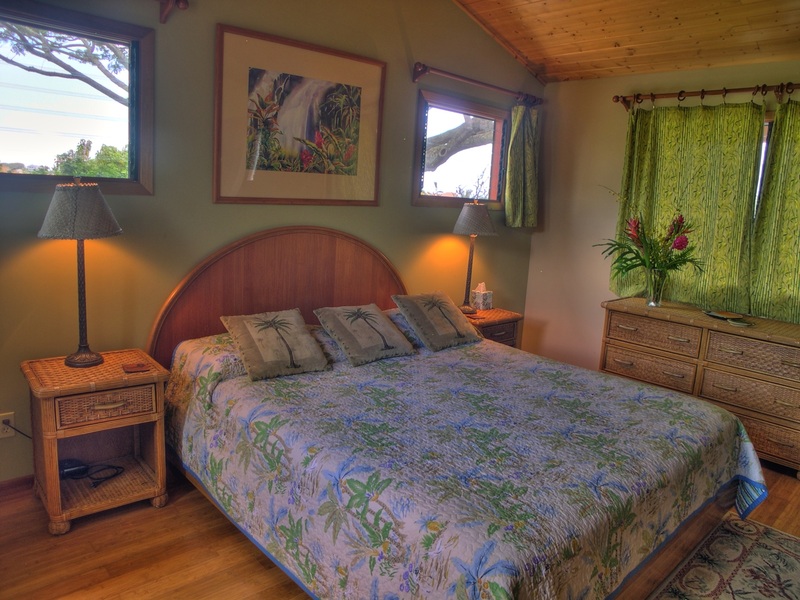 Mala Pua- the "garden" master suite is on the main level with a king bed and daybed, TV and DVD player. 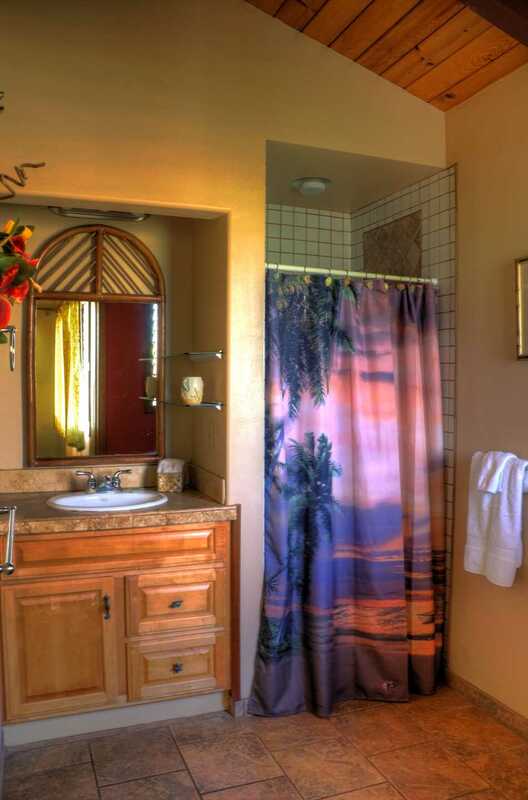 The spacious bathroom with a walk-in tiled shower offers lush garden views. 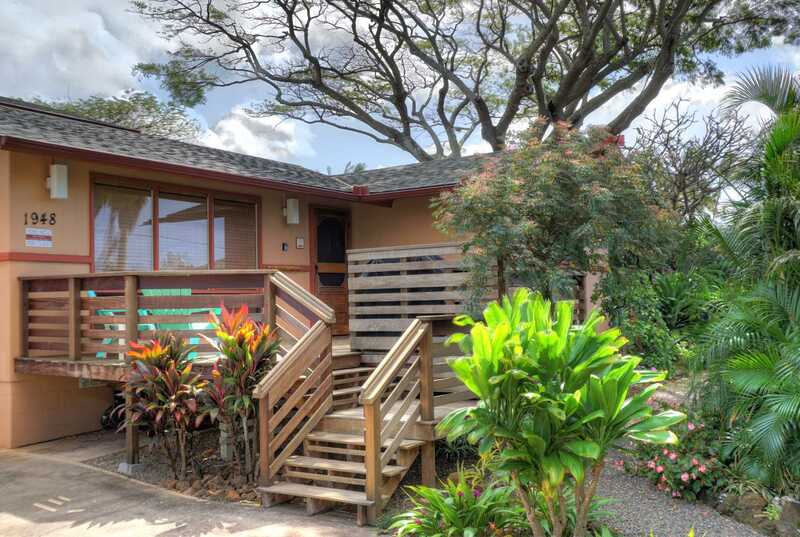 Kumulani- (base of sky) is the vaulted upstairs master suite that captures majestic mountain views. 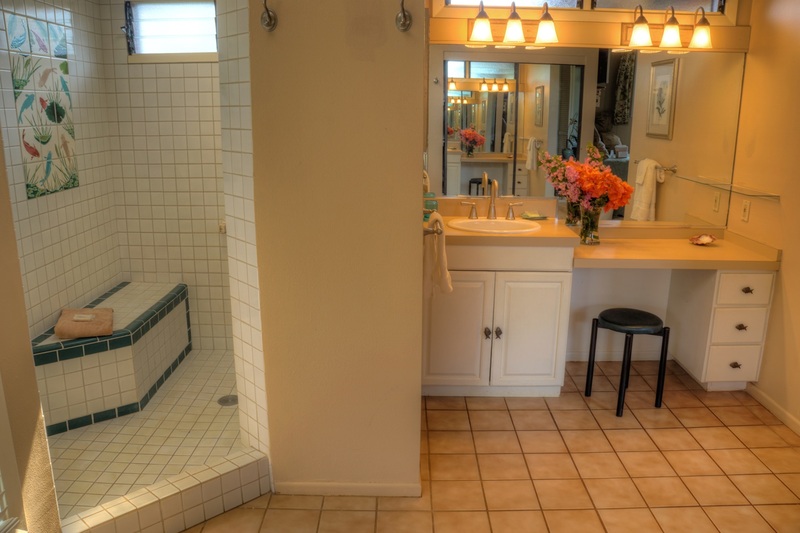 It features a king bed, TV and DVD player, bath with tiled shower. The Hula Room features a double bed with a whimsical hula decor theme. The Blue Room is equipped with 3 twin beds. Two can be converted into a king size bed to meet your needs. 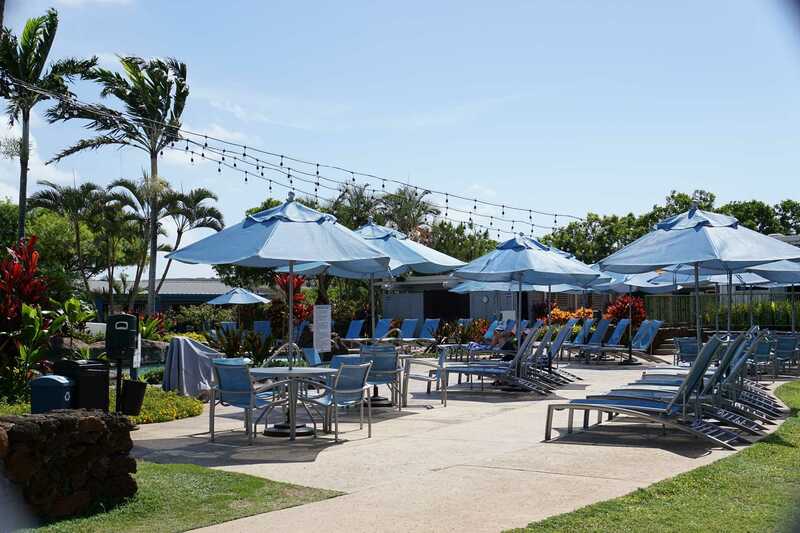 A perfect setup for 2-4 couples vacationing together, a family reunion or accommodations for wedding guests. We have high-speed wireless internet access,cable TV, streaming Netflix. 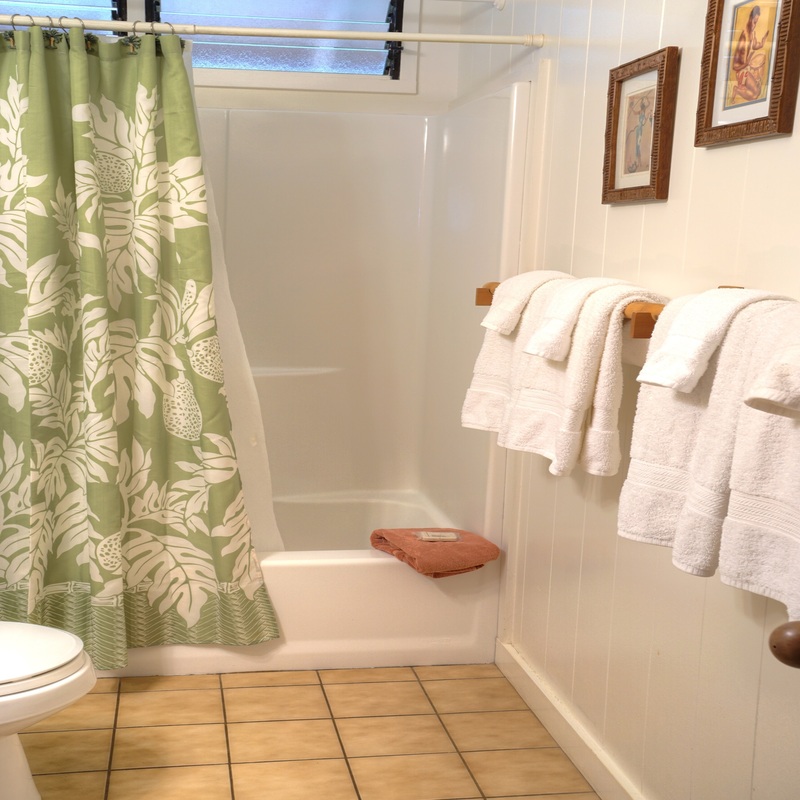 The garage is equipped with laundry facilities, and beach gear. 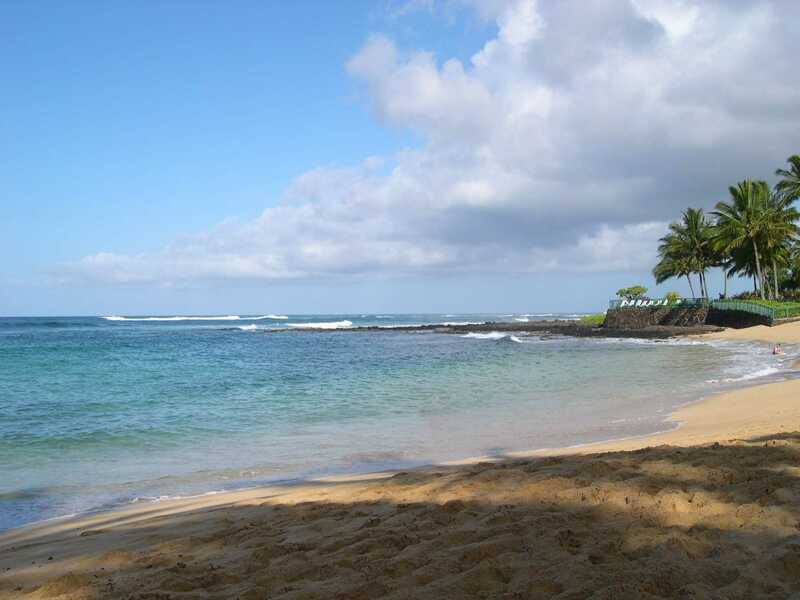 Poipu Beach offers a sheltered cove called "Baby Beach" where toddlers play in the sand and splash in the shallow waters. 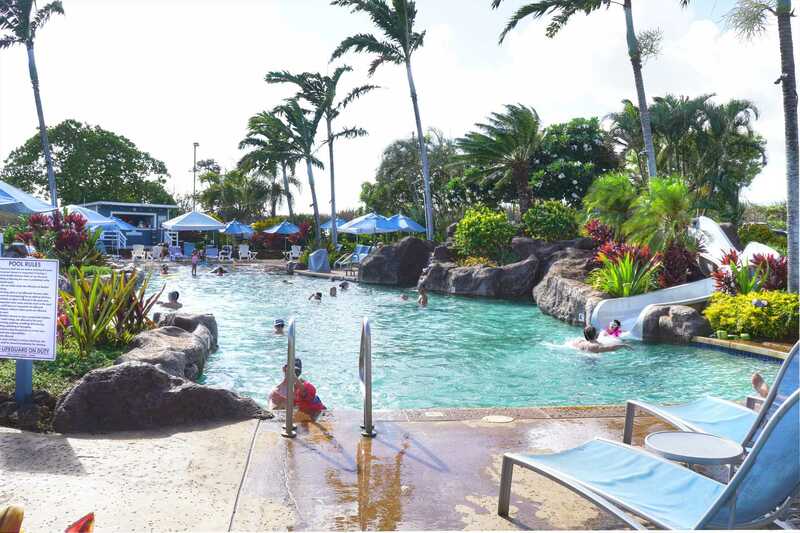 A few steps away in the clear warm water, colorful tropical fish swim beneath as you just feet from the shore. The calm waters and gentle waves are enjoyed by swimmers of all capabilities. 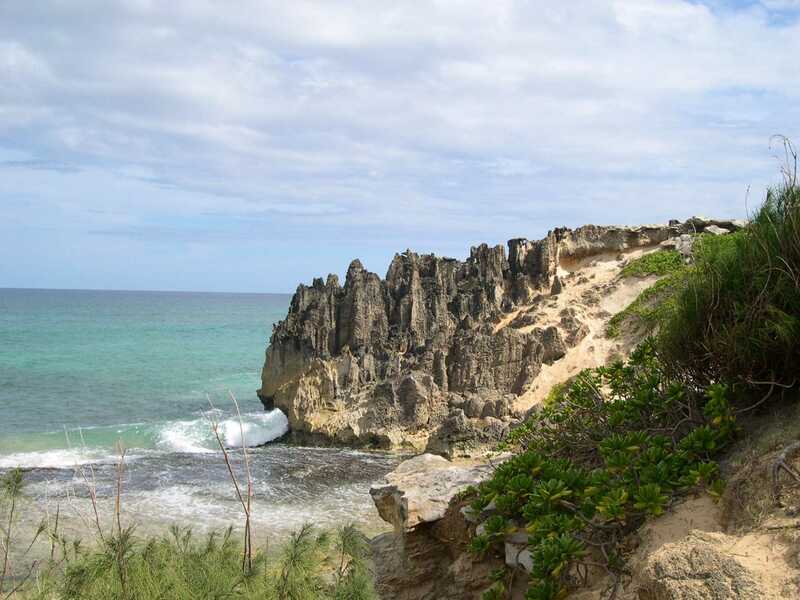 Experienced surfers can catch large-breaking waves further out beyond the reef. Brennecke Beach is renowned for body surfing and boogie boarding. If you bring your camera you may be able to capture on film a Monk Seal sleeping off a meal on the beach. Seals are protected so don't approach too closely. This accommodation was exceptional. Very clean, comfortable and unbelievably stocked with every kitchen utensil you could possibly need as well as laundry soap, dish soap, etc and a very good BBQ. Lots of beach towels, beach toys and chairs were also provided and 4 bikes were available. Terrific kitchen with top quality appliances and lots of storage. There were 10 of us including four young children and the home was large enough to enable us to have our own "space" inside plus a large deck outside. 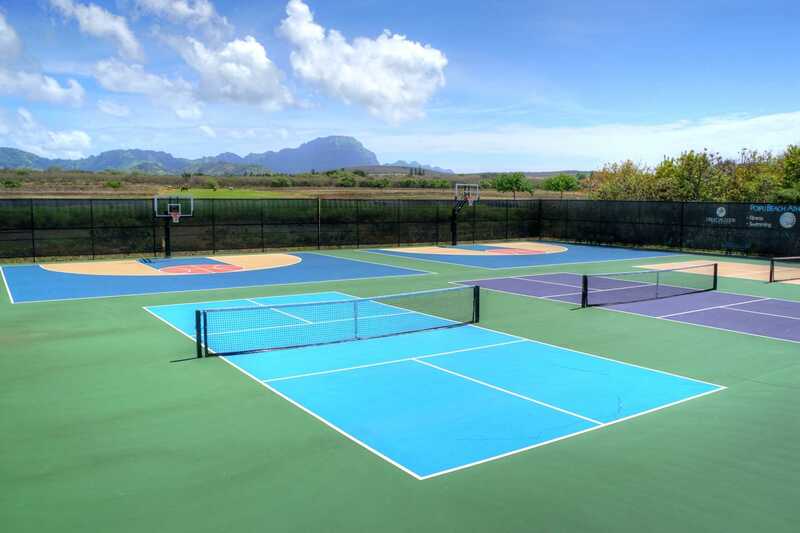 Located in a very quiet area about 5 minutes from local shopping areas and half an hour from major shopping in Lihue and about a 15 minute walk to a great beach for kids. Having a washer and dryer at our disposal was extremely convenient.The owners were very helpful and friendly. I have no hesitation in recommending this superior accommodation. This four bedroom three bath house comfortably met the needs of our twelve family members. One bedroom was a problem with four family members when meant for three but we made it work. The house was very clean and had all the bedding, kitchen appliances and utensils one would need. Very helpful when cooking for a crowd. Not really a yard for kids to play but we knew that ahead of time. Free Wifi helpful to all. 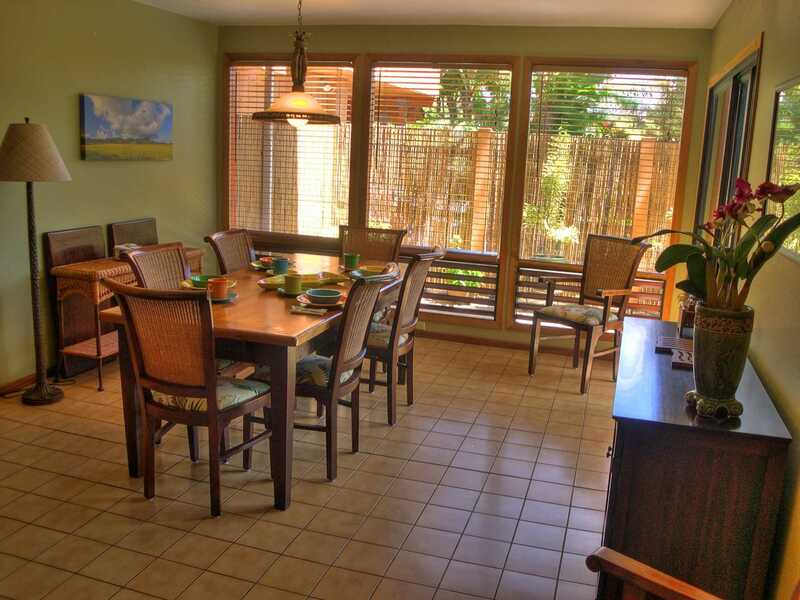 Location is good near Poipu Beach, market, Longs, restaurants and shops. 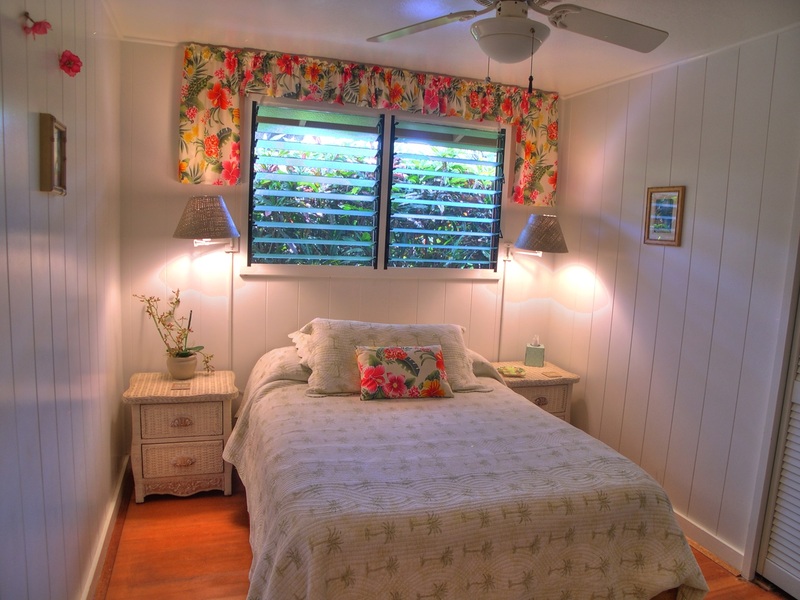 The house is very nicely decorated in Hawaiian theme with comfortable couches and beds. Upstairs master bedroom very nice with cross ventilation from the many windows. Lovely sounds of birds in the morning. Large downstairs master suite with large bath area. Everyone jealous of the ones who got that room! Smaller double bed room fine for a couple. Had the fourth bedroom with three twin beds made into a king with twin. The diningroom accommodated our eight adults at the table and we sat the four kids at TV tables. There is another table that could be used for four. Beach chairs, boogie boards and beach towels saw lots of use. Never used the bicycles but they were available. Also made use of the washer and dryer in the garage. The owners live at the rear of the property and were very helpful and pleasant to deal with . The e-mail reservations and payments were also very easy. We enjoyed our stay and would definitely stay here again. "There were seven of us staying here, grandparents, parents and two grandchildren aged 4. There was plenty of space for everyone. The house was in excellent condition with everything you could think of available for us. Every day we would pack up the cars with the cooler, beach chairs, sand toys, etc. and be off for an adventure. We spent our days hiking, going to the beach, touring botanical gardens, visiting farmers markets and much more. In the evening we would make use of the fully equipped kitchen, the deck with the grill and enjoy some "down" time. The beds were very comfortable and the owners were very nice and helpful by answering questions before we arrived and once we got there. I can't say enough wonderful things about this rental and would highly recommend it to everyone. " "We stayed here for a week in February 2014 with another family. The home accommodated 4 adults and 3 kids with plenty of room to spare. It was so well furnished for a beach vacation--bikes, helmets, numerous beach toys/mats/towels. The kitchen was perfect for feeding a group of people. It was very quiet and peaceful with views of a farm with horses and a back patio area perfect for relaxing. Having Netflix and wifi added to the comforts of home. Poipu Beach was less than a mile away. A huge thumbs up!" "I want to express to you how much we appreciate the opportunity to have stayed at your beautiful home. The home exceeded our expectations in all areas. It was spacious, clean and well equipped, especially the kitchen. We loved sharing dinners at the huge dining room table, each family prepared dinner an assigned night, and everyone was amazed at the kitchen. The beds were comfortable and the living room a wonderful place to gather. The bathrooms were large and updated and so clean. The unexpected touches such as the informational brochures, bikes, beach towels, and snorkeling and beach equippment, and washer/dryer were so appreciated. Rex and I LOVED our private retreat bedroom/bath suite on the upper level, and enjoyed the view. There was plenty of parking space for our 4 rented cars. There really is nothing that we would change about the house. And Julliana, both you and your husband were so nice and easy to deal with...thankyou so much. I truely hope that we are able to do it again some day. This was our first visit but it won't be our last." 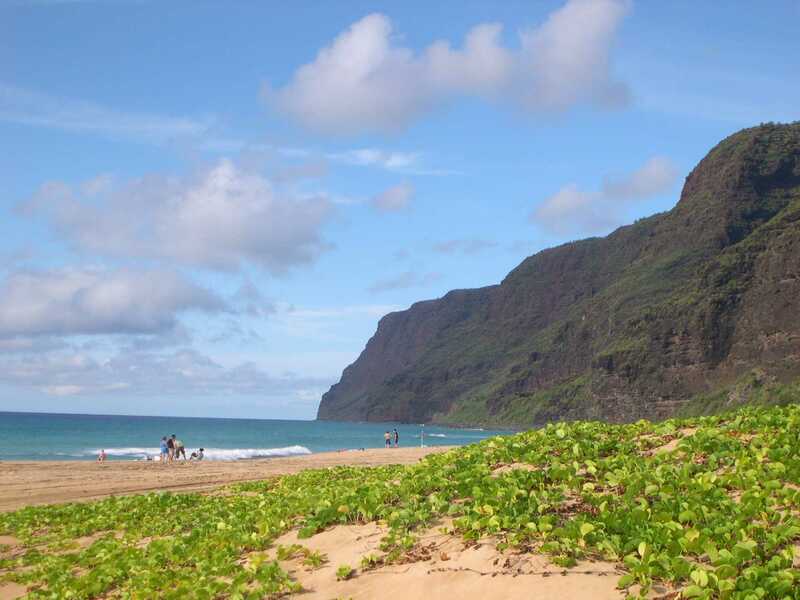 "Over the last 15 years my multi-generational family has made multiple visits to Kauai, Oahu, Maui and The Big Island; We always try and rent properties vs. staying in hotel/motels... This property is by far is the best we have ever had the pleasure to stay in!! Excellent layout of the property, two differed patio's to enjoy with seating. Amazingly clean (I can't emphasis how important this is to us, especially in Hawaii, bug free and well appointed. 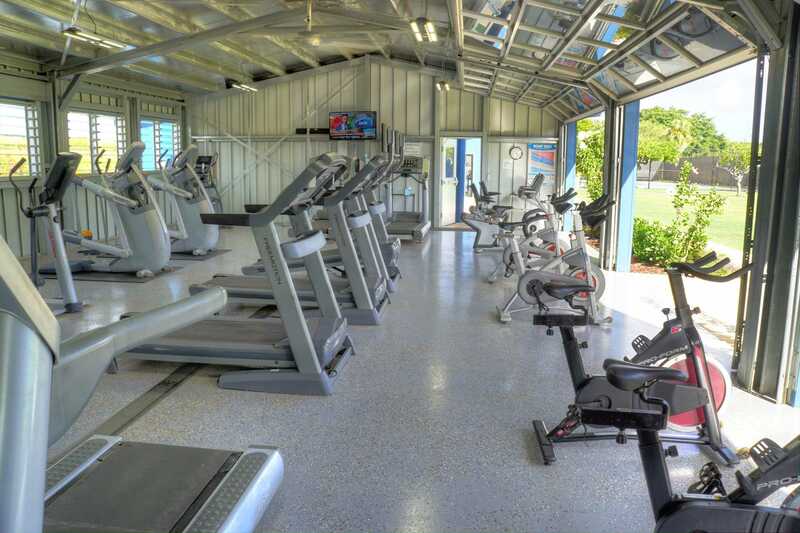 There was enough recreational equipment to fully suit all of our needs, from bikes to coolers and beach mats! 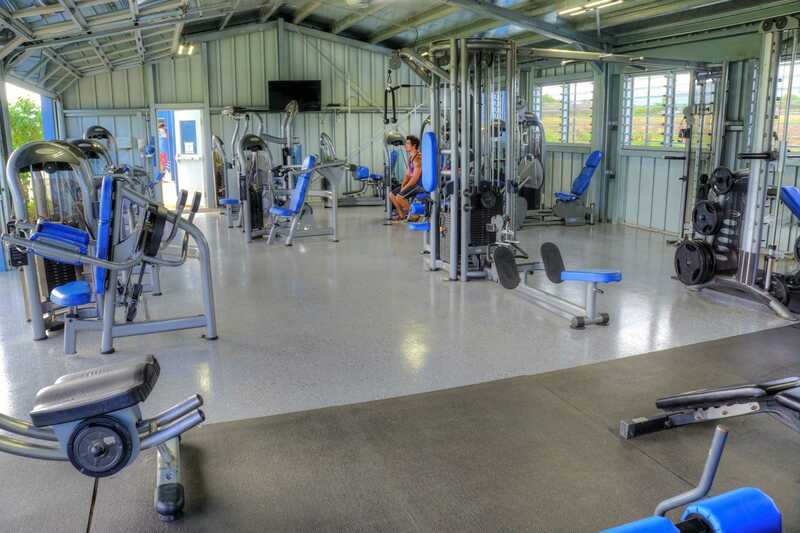 It is located near everything in the Poipu area, yet tucked back in a quiet little neighborhood! Because the owners are on site, our TV outage was addressed in minutes (can't miss the Baseball game :-) Our neighbors from home overlapped a couple of days and were staying in another property up north, the first day they came to visit they were ready to move in... They just kept going on and on about how much nicer our property was and for less cost!! We plan on coming back again and again..."
"Jim and Juliana were great to work with and very helpful. They really went above and beyond to assis us with last-minute reservations and extended stays. We look forward to working with them again in the future." 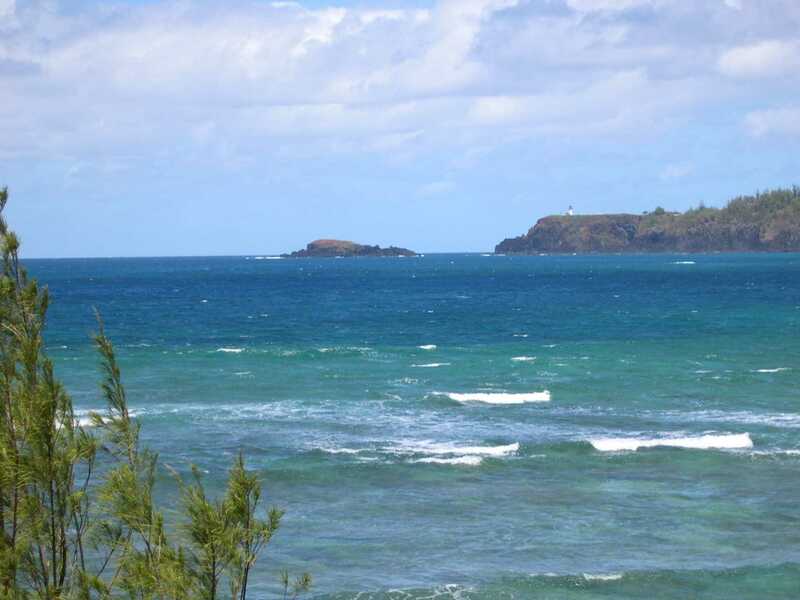 "Fun return to Kauai after 35 yrs! We honeymooned on Kauai 35 yrs ago and returned with our three kids and cousins for a fun memorable stay. We enjoyed our stay here tremendously. Everything was as advertised. More than enough space for the 8 of us. We walked, biked and drove to the beach easily. We hit costco when we arrived for big grocery shopping. The house was clean and airy. We usually had breakfast there and cooked half of our dinners. Kitchen was large and well equiped. The customer service the owners provided was wonderful. We had to fax some legal documents and the owners kindly went out of their way to help us with this. They also gave us some good advice on things to see and do. One of the highlights was a catamaran cruise up the na poli coast. 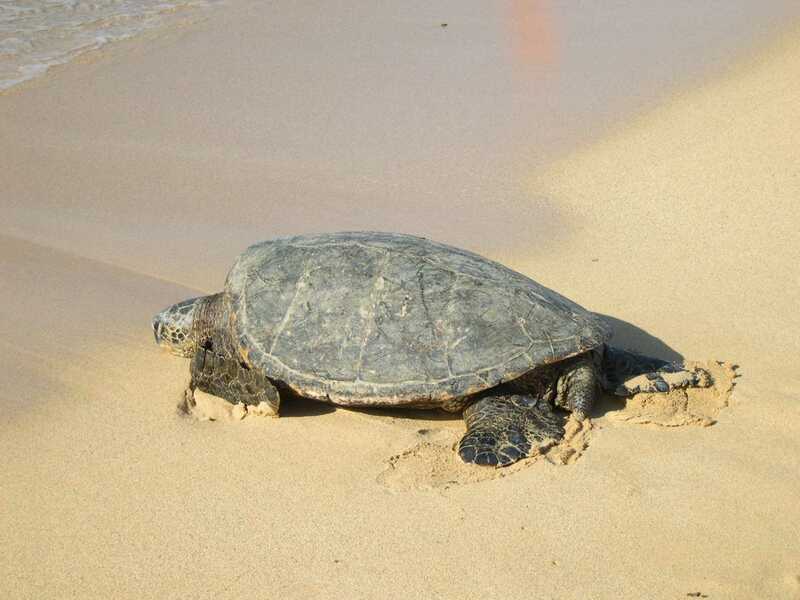 Whales, porpoises, amazing coast line, secluded beaches. We highly recommend this house and experience." "This home was the perfect location! We were a quick walk and extremely quick drive to the beach. The home was well equipped with everything one would need for a trip to the beach and lots of bikes. Laundry room made it easy to stay clean, though had restricted hours that were difficult for us. Comfortable beds and plenty of space. 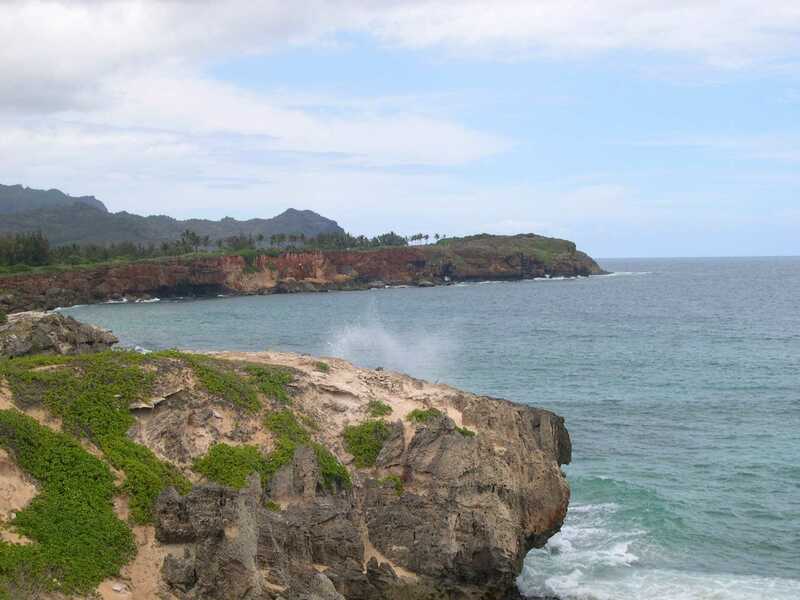 We spent a lot of time at Poipu Beach and were a drive away from anywhere on the island. Wonderful home!" "This is the perfect home for a family vacation - plenty of room for our party of 8 and wonderful kitchen and barbeque for all our meals. The house comes equiped with everything you would use on the beach from straw mats to snorkling equipment and bikes ! Our party was concerned about being 1/2 mile from the beach but ended up loving the short walk to the beach. We walked through the Hyatt one day and commented on how nice it was having our own place instead of 4 small ( and expensive!) rooms in a hotel. Jim and Julianna are fantastic owners and will make sure your stay is perfect. Can't wait to return." "Nothing but good things to say about this property. The pictures are very nice and they don't do the place justice, the place has a perfect location to get anywhere on the island. We had lot's of outings planned (one every day ) but it was always nice to come back spread out and relax after all our outings. I have been telling all my friends that this is the place to stay if going to kauai. I did alot of research on the internet and even had some fellow travelers check several places out in person before we settled on this place. The value was great." "Family and friends stayed here for a week in March. There were eight of us, and it was a perfect set-up. Everything that is advertised about this house is true and more. The kitchen was well equipped, and the beach equipment in the garage was great. We used the bikes, the beach chairs, the beach toys, the beach towels, and even used the washer and dryer. The beach is only two minutes away by car, and it is great. We had a 3 and 5 year old with us, and the baby beach was wonderful. The rest of us spent time on the regular beach and had a wonderful time. There are many shopping areas and restaurants nearby, so you really have everything you need. Jim and Julianna were always available to answer questions about the area. 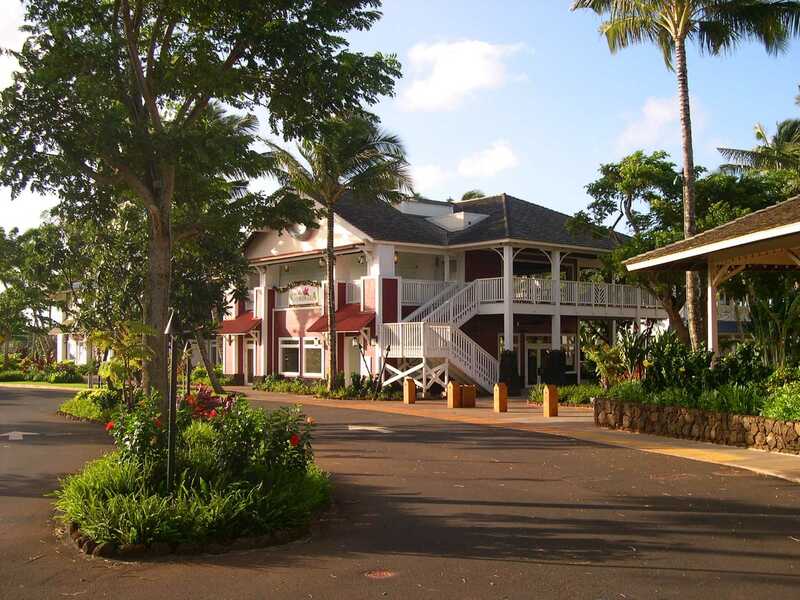 This is a wonderful place to stay on Kauai, so don't hesitate! " "Outstanding house, great location! We stayed for a week in this great house. There were five of us, and the house was large enough for us to be very comfortable. Everyone kept saying how much nicer it was to be staying in a house, compared to a hotel, or even a condo. The neighborhood was quiet and very centrally located, for our purposes. 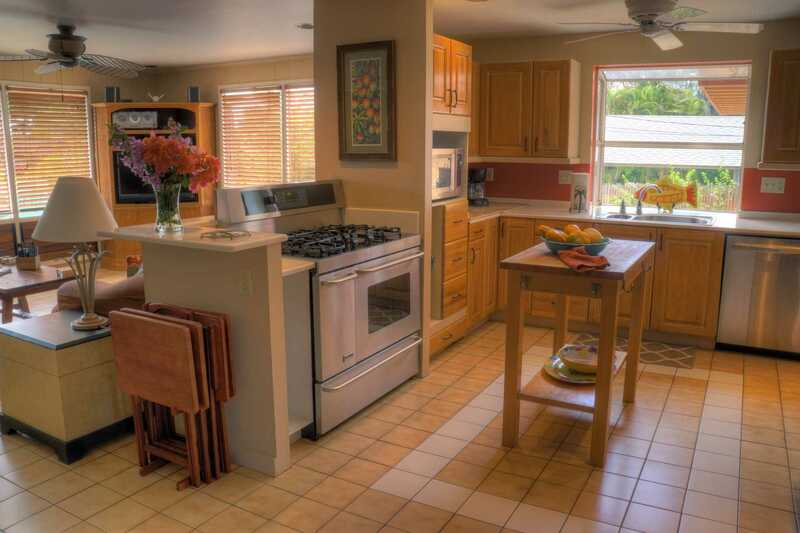 The kitchen was especially nice, with all the conveniences and appliances you could want. The wi-fi was fast and worked great for all three of the computers we had with us. The beach equipment was used and appreciated. The description is accurate and I can't really think of any criticism at all - it was just a wonderful place to be based for our first visit to Kauai. We happened to be there at Halloween, and we had been warned by the owners that Halloween is a big holiday in Hawaii. We had a great time sitting on the front porch and handing out candy (thank you Costco!) to over 250 trick or treaters. " "Like Having Our Own Home In Kauai! One of the great things about this vacation home is that it is outfitted with many amenities not usually available with other rentals. The hosts generously allowed us use of their bikes, beach towels, underwater sports gear, boogie boards, and beach chairs. Of course this was a great convenience and money-saver for us. The home is very nicely furnished and lovely in decor, well-equipped, spacious and incredibly clean. The house is located in a neighborhood about a half mile from the beaches and this was a perfect place for our family to be. The kids were free to walk or ride bikes down to the beaches and shops of Poipu. 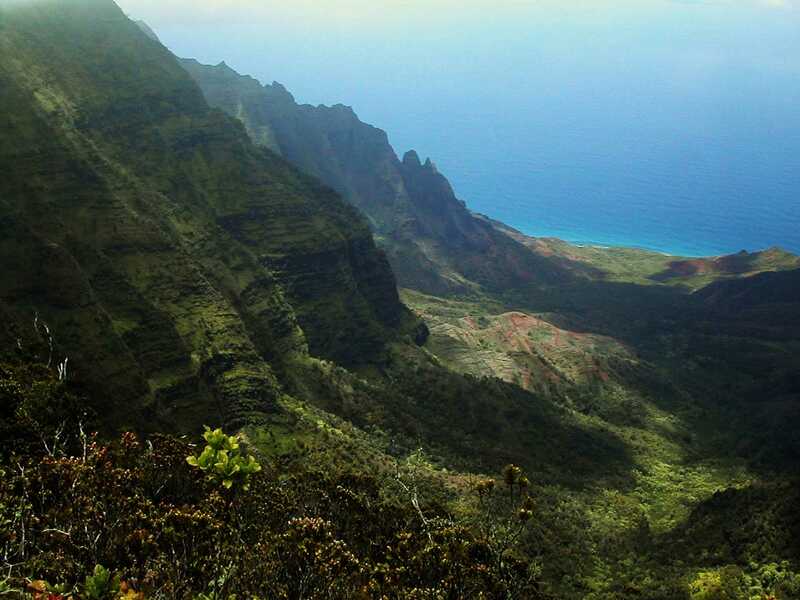 Staying at Ala Muku was like having a home of our own in Kauai." 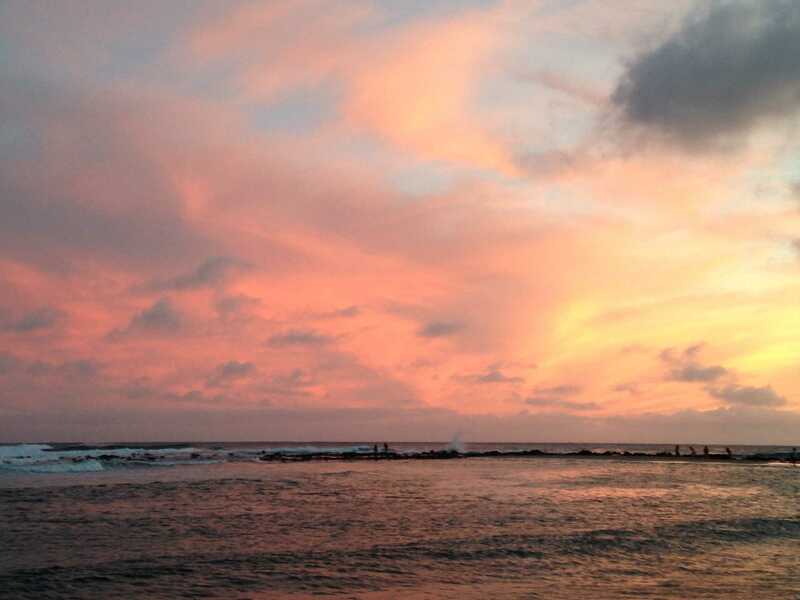 "Dear Jim and Juliana, we are still riding the wave of Aloha from our dream trip to Kauai! We wanted to thank you for letting us stay at Ala Muku for our vacation. What an island find! You have thought of every last detail, from kitchen goodies to surf toys, how thoughtful you were in outfitting this vacation home! We had a wonderful stay, and enjoyed every minute of it!." "Family vacation for us! Again, thank you for your hospitality, and the use of your wonderful vacation hale! Sincerely, The McBride 5"
"Aloha Jim and Juliana, we just loved staying at your house for the 3rd time, and if I can afford to take my family again next year we'll certainly choose your lovely and comfortable home again. It's like coming to our own vacation home, and the children enjoy the familiarity of your house. I want to make it a tradition, for them, pending on finances. Thank you for making our vacation so comfortable, we love it, and we'll be back. Mahalo, Ingrid, David, Becka, and the 3 little ones."